Born in Norwich, 6 Aug 1504. He came of a well-to-do family, but little is known of his origins and early life. Educated at St. Mary's Hostel and at Corpus Christi College, Cambridge, in 1521, where he took his B.A. degree in 1525, perhaps in 1524. He was ordained in 1527 and and that year elected Fellow of the College, having refused an offer to migrate to Wolsey's new foundation of Cardinal College, Oxford. 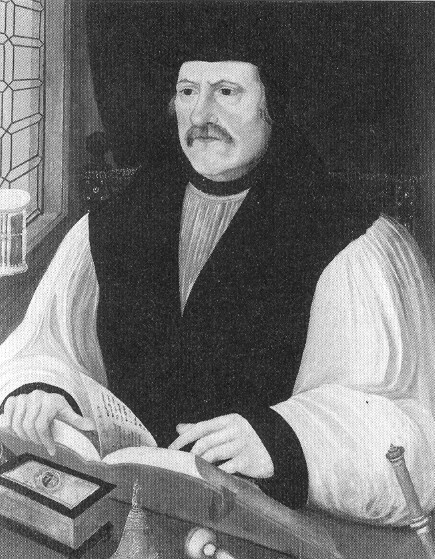 He became a popular and influential preacher in and around Cambridge, but he was once (in about 1539) attacked before Lord Chancellor Audley for alleged heresy. Audley dismissed the charge and urged Parker to 'go on and fear no such enemies'. One other fact in Parker's early days at Cambridge was to have immense influence on his later life - he became the firm friend of William Cecil and Nicholas Bacon. In 1535 Parker was reluctantly persuaded to accept the office of chaplain to Anne Boleyn, who gave him the deanery of Sr. John the Baptist College, Stoke-by-Clare in Suffolk, where he spent what were probably the happiest years of his life pursuing his intereses as a scholar, improving the college and saving it from dissolution when Henry VIII attacked the monasteries. Anne also before her execution commended her daughter Elizabeth to his care. This peaceful and busy life went on until 1544, when Parker was appointed Master of his old college at Cambridge, Corpus Christi. He became Vice- Chancellor of the University and also Dean of Lincoln. His period as Vice-Chancellor involved him in some stormy episodes: he quarrel- led with Gardiner, the Chancellor of Cambridge, over the performance of a scandalous play at Christ's College, and Gardiner never had a good opinion of Parker from that time onwards. He had to withstand an attack on the revenues of the Cambridge colleges by the Crown which he warded off with great tact and skill. But perhaps in the long run the most important single event in Parker's life took place on 24 Jun 1547, when he married Margaret Harlestone, daughter of Robert Harlestone of Mattishall, Norfolk (b. 1490). They had been betrothed for seven years, but as long as the law forbade the marriage of clergy Parker was doomed to celibacy: in anticipation that the law would be amended by the Lower House of Convocarían, Parker married this remarkable and admirable woman. The marriage led them both into great difficulties when Mary Tudor came to the throne, and the outspoken objections of Elizabeth, when she became Queen, to married clergy caused both Parker and Margaret great pain and trouble. But Margaret proved herself equal to all occasions and roused the admiration of Nicholas Ridley to such a pitch that he enquired of Matthew Parker whether Margaret had a sister, for if he himself were ever to marry he could not hope for a better wife than a lady like Mistress Parker. Even Elizabeth I was compelled in later years to acknowledge the worth of Mistress Parker. Parker was a modest and far from self-confident man and much of his success was due to his wife: it is noticeable that when she died his powers began ro fail quickly. When Ket's rebellion broke out (1549) in Norfolk, Parker happened to be in Norwich. As the rebels used the English Prayer Book and allowed licensed preachers to address them, Parker went to the camp and preached a sermon from the 'Oak of Reformation'. He gave them excellent advice, not to destroy the crops, not to shed human blood, and not to distrust the King. Ir was a rash sermon to preach in the circumstances and Parker escaped the fury of the rebels only 'by the judicious raising of the Te Deum'. His purpose probably was then, as always later when he was Archbishop, to support law and order. When Mary came to the throne in 1553, Parker, as a married priest, was deprived of his preferments and he had to disappear into obscurity. He lived with a friend and thoroughly enjoyed his retirement from public life and administrative duties, but he suffered an accident when one day he fell from his horse, and for the rest of his life suffered from a strangulated hernia which brought him incessant ill-health and eventually killed him. In 1558 the accession of Elizabeth opened a new chapter in Parker's life. He himself would have liked to return to Cambridge and restore the University, which had fallen into decay. But the problem of the Anglican Church prevented this. Elizabeth and Cecil were faced with the difficulty of holding the balance between the old Roman Catholics, who still accepted the Pope as head of the Church; the Henrician Catholics, who accepted the Catholic religion but repudiated the Papal supremacy; and the extreme Protestants, who were now returning from exile on the Continent. It was essential to find the right man as Archbishop of Canterbury. Only a man of balanced judgement, of deep learning, gentle yet firm, conciliatory yet courageous, could successfully fill the office: only Matthew Parker had all the qualifications. He tried desperately to avoid the responsibility, but Elizabeth and Cecil knew that he was the right man and they compelled him to accept. Years later Parker declared that 'if he had not been so mueh bound to the mother (Anne Boleyn), he would not so soon have granted to serve the daughter'. He was consecrated in Lambeth Palace Chapel on 17 Dec 1559. This consecration by four bishops surviving in England, though without sees, is the connecting link between the old and the new succession of Orders in the Church of England. The Queen did not quite approve of married clergy and is reported to have told Margaret Harlestone that she did not know what to call her, saying “Madam I many not call you, mistress I am ashamed to call you”. Under the name “Thomas Martin”, Parker published a defense of married clergy. Bishop Sandys nicknamed Margaret “Parker’s Abbess” because of her gravity, chastity, discretion, and piety. The Anglican Church owes much to the wisdom and judgement with which Parker guided her course through a time of great difficulty, when she was in peril, from the Roman party, on the one hand, and the Puritans on the other. His devotion to the cause of learning was shown by the magnificent collection of books which he made and bequeathed to his College, and by the publication of the "Bishop's Bible". He was, himself, the author of various works, chiefly on the history and the government of the Anglican Church. Parker's first important piece of work was the Metropolitan Visitation of the southern province in 1560-61 to investigate how far the Act of Uniformity and the Injunctions of 1559 (a cacle of orders to protect the new Church from Catholic 'superstition' - e.g. the cult of saints, reverence for relics: to ensure that only sound Protestant doctrine should be taught: 'to plant true religion') were being carried out and to correct moral offences among clergy and laity. At that moment things seemed to be quiet and the nation to be accepting the new order. By 1563 signs of the coming storm were evident. Both Parliament and Convocationn were worried by fears of Papal intrigues, of the hostility of France in the south and of dangers from Mary, Queen of Scots, in the north. Measures against the Romanists were stepped up and Parker was much troubled by the prospect of religious persecution. He took pains to ensure that the measures weré leniently enforced, so that for the first ten years of Elizabeth's reign life was not made too difficult for the Romanists. With the revival of the Council of Trent, with the increase in Papal propaganda by introducing into England controversial books, and with the Puritan propaganda which was being broadcast by the Protestant refugees and with which even some of the Anglican bishops were sympathetic, Parker set out to provide uniformity in doctrine for the Elizabethan Church. 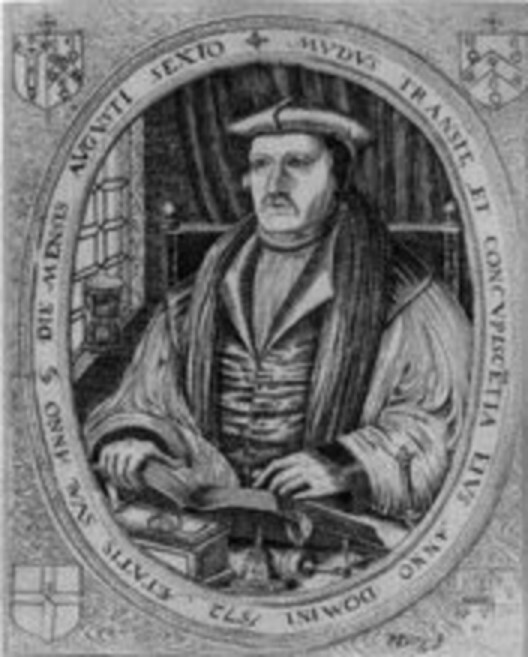 He accordingly reduced Cranmer's Articles of Religion (1563) from forty-two to thirty-eight in number (in 1571 they became the Thirty-Nine Articles) and various Homilies and Catechisms were also issued. All were intended to lay down the fundamental points of belief. Another problem wirt which Parker had soon to deal was the dispute over ceremonial and ritual. There was a large party in Convocation which would have liked to destroy the whole settlement about ritual made in the Prayer Book and the Injunctions. Many clergy were taking the law into their own hands and were pulling down rood-lofts, destroying chancels and some were even turning the organs out of their churches. Similarly there was no uniformity in the vestments which the clergy wore or refused to wear. In orher words, Parker was now faced with the problem of Puritanism. For the rest of his life he was continuously harassed by the disobedience of many of the clergy, by the irresolution of the Queen, and by the hostility of such courtiers as the Earl of Leicester. Parker dealt with these conflicting opponents mercifully and reluctantly. Each year the situation became more difficult, the Puritans increased in numbers and in fanaticism, and the Papacy grew more aggressive. The Rebellion of the Northern Earls in 1569, the Bull of Excommunication (1570), the massacre of St. Bartholomew (1572), persuaded the gentle Parker that strong measures were necessary and that Mary Stuart, (by now a prisoner in England) would have to be eliminated: 'If that only desperate person were away as by justice soon it might be, the Queen's Majesty's good subjects would be in better hope and the papists' daily expectation vanquished'. A sterner policy was now needed to defend that Church, a Whitgift rather than a Parker to direct the battle. One other achievement belongs to Parker, perhaps his greatest. He had always made it his business to see that this 'new' Church was not in fact a new Church, that it should be the old, original Church revived. In 1566 he paid out of his own pocket John Day to cut in brass the first Saxon type for the publications of A Testimonie of Antiquitie, showing, 'the ancient faith of the Church of England touching the Sacrament of the Body and Blood of the Lord... above 600 years ago'. The book proved that it was a mediaeval innovation which forbade the clergy to marry and which restricted the receiving at the Communion to one kind. He was, as Strype said, 'a mighty collector of books', not as a mere bibliophile but for a practical purpose, to help the Church of England in its struggle against Rome and the Puritans. Although Parker was a modest and retiring man, hating publicity and ostentation, he had a proper regard for the office of Archbishop and for his duty as a hospitable hose. He himself was very sparing in his diet, but he entertained liberally and his home life was organized on a spacious scale: he was given special leave by the Queen to maintain a body of forty retainers in addition to his regular servants. Among the many visitors who came to Bekesbourne Parker was once compelled to entertain the French Ambassador. Parker was highly suspicious of his guests, whom he looked on as religious and political spies. Parker was in many ways naiffe, bur he was also shrewd and be kept a close watch on the Frenchmen. After the party had left, Parker sat down and counted his spoons and was surprised to find that none had disappeared. In 1566 a description of Margaret Harlestone household indicated that it included two daughters-in-law, Joanna Cox and Frances Barlow, both daughters of bishops, along with Parker’s niece, Mrs. Clark, a Mrs. Baker and her daughter, and Parker’s comptroller’s wife. Each of them had a maidservant. At the time of her death, she owned Norfolk House and the Bell Inn, west of the Archbishop's palace in Lambeth, formerly the residence of the dukes of Norfolk. Parker died on 17 May 1575, worn out by pain and toil. He had endured much, for the Queen left him to take all the blame when he carried out her orders and they proved unpopular. He was buried in Lambeth Church and his tomb was desecrated by the Puritans in 1648. When Sancroft became Archbishop, Parker's bones were recovered and reburied, with the epitaph, 'Corpus Matthaei Archiepiscopi hic tandem quiescit'. E. W. Perry, Under Four Tudors, 1940. Canon C. Smyth, The Listener, 30 October 1947. V.J.K. Brook, Archbishop Parker, 1962.